Busy streets, condensed life style, an office to attend, a chat to strike, and a jump-cut to a life that follows a daily routine. One year after September 2014 floods, life seems gradually pedalling back to normal. But the vitality that somewhere seems to overlook the experiences of last September which left thousands homeless and displaced, has still many stories to tell. September 5, 2014. Rafiqa begum, 55, lives in one of the posh areas of Srinagar, Raj Bagh. She is lending hand to her worker, who is clearing the muck outside the entrance of her huge mansion that reads Rose villa, 298. Rafiqa is a widow for last 10 years, a homemaker who lives alone with her youngest son, Mujtaba, a 12th standard student. In all these years, Rafiqa managed her expenses from the rent, her tenants paid her monthly. Rajbagh is like a dual faced locality. There are lanes that don’t have a hint of flood. These lanes house the so-called “elites”. While these elites had their houses restructured, roads macadamized, and walls towered up, there is a section that still lies damaged. Not far, Ikhrajpora is into economic crisis due to September floods. The tenants are gone, while the owners have shifted to their kin’s, but duty bound to visiting their disfigured, seemingly abandoned dwellings, every day. “Flood has left everything to bits. It has been already seven months since I started construction and still it’s not complete,” says Mukhtyar Ahmad, pointing to his house that looks like an earthquake hit. While proprietors migrated to their nearest relatives, tenants remained in a fix. “I had nowhere to go. Spent ten days under open sky at Nowgham bypass,” says Ghulam Ahmad Tantray, a matchmaker from Kupwara who lives on rent in Rajbagh in a one bedroom house. With no place to go, a month after floods, Tantray was back at his rented room. Unlike many, he had not shifted to his native place. “I have no family, just a sister who’s married. I am on my own. I earn my living by helping people find their soulmates,” says Tantray. The walls of Tantray’s room have an impression of a sponge. The colours have faded, and the windows have crevices with mud jammed. Everything new in his room has been gifted by the well-off clients he visits. 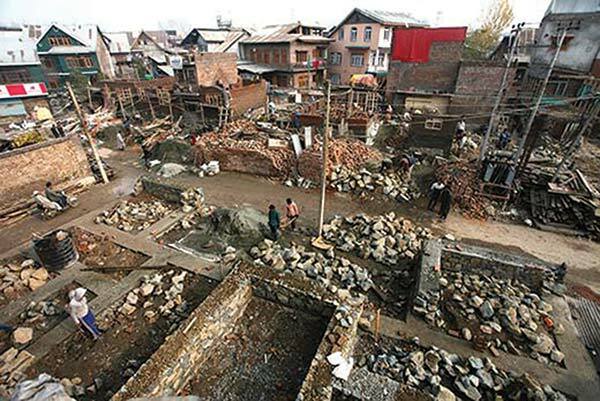 Like Tantray, in last two decades thousands of families migrated to Srinagar city in search of better livelihood. And Rajbagh and its adjoining areas were their first choice. Tabasum Nadim Mir, 44, had two tenants who had a business setup in Srinagar. On day one of floods Tabasum’s family along with their two tenants were rescued to a hotel nearby. “We stayed at the hotel for a week,” says Tabasum. After four days Ikhlaq and Adil left for their home in Beerwah, Budgam. “They visited just once after the floods, that too to check their stocks which were completely damaged. They had met huge loses which they couldn’t cope up with,” says Tabasum. After floods, only one of the two families returned at Tabasum’s house as tenants. It was of Khalida’s. “We ran away leaving everything behind. It wasn’t a situation where one could think of locking doors or anything. Our lives were at stake,” says Khalida, who hails from Kishtiwar district. Khalida claims that she had six months stock at her house when floods came. “Everything got destroyed by floods,” says Khalida while her husband, Muhammad Hussain looks overly exerted about the matters. “It takes a lot to get things done, especially when you toil through the sweat of your brow,” says Mohammad Hussain, parading a tedious gesture. Interestingly Rajbagh is also home to thousands of non-native migrants who visit Kashmir looking for better economic avenues. Anjali, 29, sits with an edgy look across a second hand television set watching soap opera. Her husband earns his living by selling fast food on a makeshift kiosk outside DAV School in Jawahar Nagar. “Floods left us impoverished,” says Anjali. After floods hit Rajbagh, Anjali and her husband had to stay in a Gurduwara, until they could go back to their home in Bihar. In March 2015, when Anjali and her husband finally came back, they found their room still unclean and murky. Apart from displacing tenants from one district to another, September floods also dislodged them from one house to another within the same locality. Saara, 80, resident of Chrar-e-Sharief shifted back to Jawahar Nagar two months after floods. Prior to that, they lived in a house a few hundred meters away from their current residence. The former had collapsed to bits during floods. “My son is in police. And my grandson studies in a school nearby. We had no other alternate but to comeback,” says Saara breathing in a hukka. “We had to replace every bit here,” she says, looking across her kitchen. But not all could return to their original dwellings like Saara. A few of them had to make alternative arrangements as the houses they earlier lived in were still under construction. Before floods Anna Afzal, 29, who hails from Assam, lived at Jawahar Nagar with her husband who is an assistant professor at SKAUST, but later they had to shift to Sanat Nagar. “For four days, we were on the terrace, and then for a week on the bund. Everything looked like a graveyard. Desolated and hushed,” recalls Anna. Srinagar being a melange of identities also absorbs a considerable population of students from Ladakh and other parts of Kashmir. When floods came, helpless students like Ishtiyaq, a BCA final year student from Leh, presently studying at Kashmir University, were apprehensive about their future. “I thought I would not be able to continue my studies in Kashmir. The worst thought was about going to Jammu and start afresh as a 1st year candidate,” says Ishtiyaq. But the fear was not exclusive to non-Srinagarites only. Shoaib Ahamd Wani, 20, a diploma engineering student from a private college in Srinagar, though his career has come to a halt. He has lost his years of treasure trove: books. “Every single document I had collected was lost in a jiffy. That was all I had,” says Shoaib. Now a year later, a visit to these once-muck swallowed lanes still impart a disturbance in one’s mind. The whiff of a catastrophe still swirls around, only to remind one of the most disastrous periods in the history of Kashmir.